Based on pictures that have been just released by Chinese spotters, it appears that the People's Liberation Army Navy (PLAN or Chinese Navy) next in-line Type 052D Destroyers (NATO reporting name Luyang III class) will be fitted with the H/PJ-11 close-in weapon system (CIWS) instead of the smaller H/PJ-12 currently fitted on existing vessels of the class. 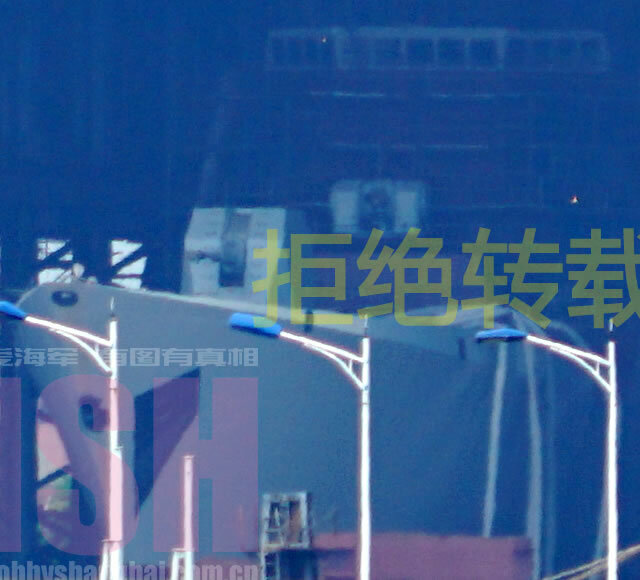 Chinese spotter photo showing a H/PJ-11 CIWS fitted on a Type 052D Destroyer currently under construction (antenna and sensors not yet fitted) at Changxing Jiangnan naval shipyard. 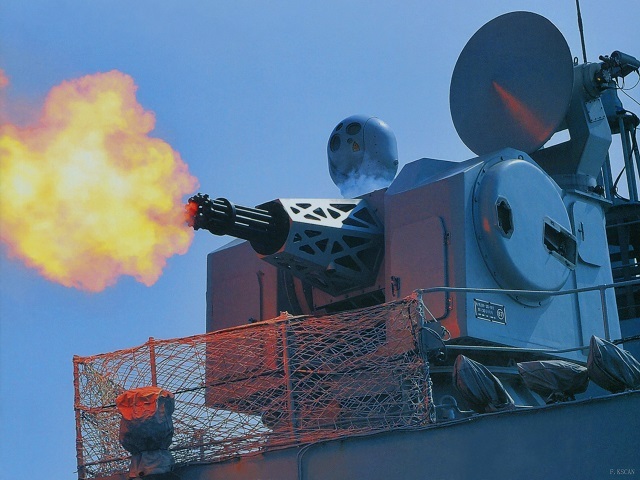 The H/PJ-12 seven-barreled 30mm CIWS (sometimes referred as Type 730 which is the export designation.) is present on the first four destroyers in the series already commissioned (as well as on a few other hulls currently at various stages of completion). It is estimated that the H/PJ-12 is getting replaced by the much larger H/PJ-11 eleven-barreled 30mm CIWS (export designation Type 1130) starting with the ninth hull under construction at Changxing Jiangnan naval shipyard (near Shanghai) and the third hull currently being built at Dalian shipyard (Dalian Shipbuilding Industry Company member of CSIC - China Shipbuilding Industry Corporation). The new H/PJ-11 appears to be an evolution of H/PJ-12. It has an increased rate of fire (local media have reported a 10,000 rounds per minute firing rate). 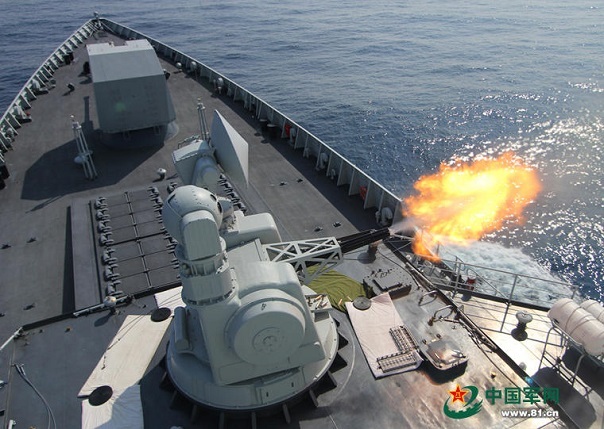 This type of CIWS was so far exclusively fitted on the Liaoning aircraft carrier and the latest few Type 054A Frigates. Chinese TV reported that following studies and testing, H/PJ-11 is able to intercept incoming anti-ship missiles up to a speed of Mach 4 with a 96% success rate. There may be other modifications or upgrade on the latest Type 052D Destroyers (or this may even indicate a new batch or mod.) but this is impossible to confirm at this time. The installation of the larger CIWS shows that there are plenty of growth margin (in terms or weight, space and power supply) on this type of destroyers. 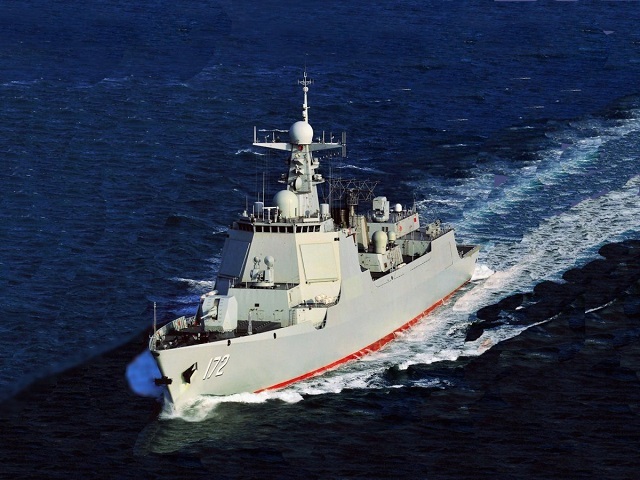 At least 12 Type 052D Destroyers are expected to be built for the PLAN, most of them (80%) by Changxing Jiangnan naval shipyard near Shanghai (the rest at Dalian shipyard in North East China). The PLAN recently commissioned the fourth unit with the South Sea Fleet.